CMP Nourishment/Medicine Centers are high quality stainless steel combination cabinets and working units. Our Nutrition/Medicine Centers have been designed for the storage and functional requirements of the hospital and emergency room environment for food and medical storage and preparation. CMP Nourishment/Medicine Stations have evolved into the industry standard for this application. CMP has been building high quality stainless steel Nourishment/Medicine Stations for over 65 years and they can be found in almost every hospital in the U.S., along with many worldwide. Contact us so we can configure Nourishment/Nutrition/Medicine Stations to meet your unique requirements. CMP Nourishment/ Medicine Centers are completely inter-piped and inter-wired, requiring only one single connection for each service. Required service connections are ½“ I.P.S. for hot and cold water supplies; ¼“ cold water supply; 1½“ for waste. The unit can be wired for: 120/208 VAC, single-phase, 60 Hz, three wire; 120/208 VAC, three-phase, 60 Hz, four wire; or 115/230 VAC, single-phase, 60 Hz three wire with a total of 40 amperes being required (single connection in circuit breaker panel). CMP Nourishment/Medicine Centers are constructed of type 304 stainless steel with No. 4 finish. Welding is done by the Heliarc process. All exposed welding is ground and polished to match the No. 4 finish. CMP Nourishment/Medicine Centers have counter top working surfaces that are the full width with 10” x 14” x 7” ( 254 mm x 355.6 mm x 177.8 mm ) deep one-piece, die-stamped sink welded welded in top. The sink has radius corners and is integrally welded into the countertop. The sink has a combination hot and cold water deck-mounted faucet. Also, a refillable deck-type soap dispenser is provided. CMP Nourishment/Medicine Centers have a 2,200 cu. in. (39 liter) narcotics/hypnotics cabinet located in the upper left section of the Medicine Center and is equipped with outer and inner doors. Each door has a separate lock and key – the outer door secures the hypnotics locker and the inner door secures the narcotics locker. A red warning signal is provided that activates when these doors are in the open position and remains on until the doors are locked. CMP Nourishment/Medicine Centers include two self defrosting refrigerators that is an integral part of the lower section of the Medicine Center. The refrigerators’ capacity is 4.0 cu. ft. for biologicals and 6.0 cu. ft. for nourishment and is equipped with three adjustable perforated stainless steel pans. 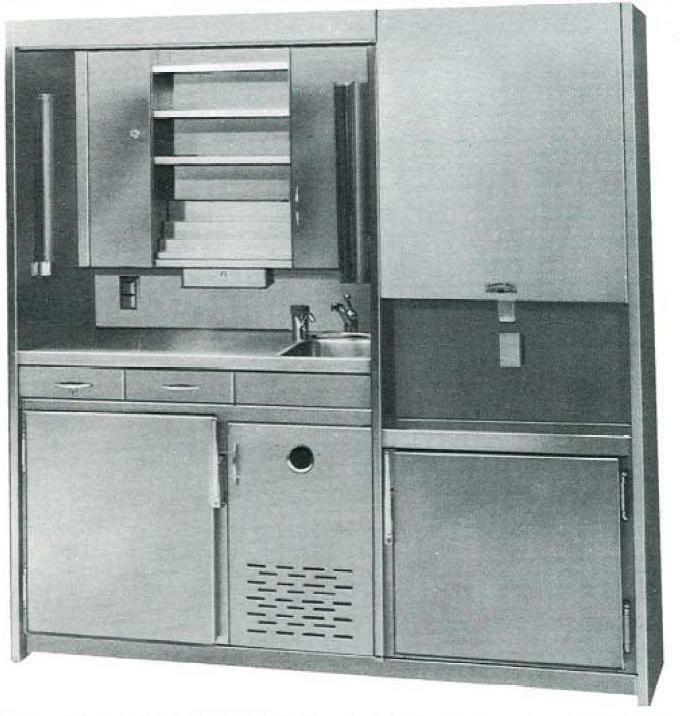 The refrigerator is of double-wall construction and is fully insulated with urethane foam-in-place insulation. The refrigerator door is of No. 20 gauge stainless steel and has an edge-mounted latch and lock. The refrigerator is cooled by an air-cooled, 1/3 hp, hermetically sealed condensing unit (5-year warranty on the compressor). 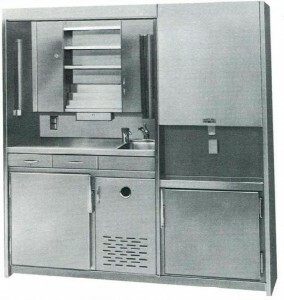 The refrigeration system has a temperature control with adjustable temperature setting – control is preset to maintain a 38° F to 40° F product temperature but can be adjusted for a range of 36° F to 46° F.
CMP Nourishment/Medicine Centers have a storage compartment above the counter top. The compartment has an interchangeable step or tray shelves for medicine storage. Adjacent closed section contains three adjustable shelves for storing nourishment and solutions. CMP Nourishment/Medicine Centers have recessed fluorescent lights located at the front of the cabinet that is controlled by a silent switch. CMP Nourishment/Medicine Centers have a medicine card rack located on the left hand wall above the countertop. The card rack has 24 compartments for 2″ x 2″ cards. CMP Nourishment/Medicine Centers include an ice-maker that produces 350 lbs. of hard crystal-clear compacted flake ice chunks per day, on a durable stainless steel evaporator. A 60 lb. capacity bin is included for the storage and dispensing of ice. Ice in the bin is agitated automatically every 20 minutes to prevent congealing. The bin is constructed of molded gel-coat with urethane foam insulation sealed with vinyl coating. Ice is dispensed by pushing a button on front panel. The ice-maker compressor is warranted for 5 years, and the water-cooled condensing unit is charged with environmentally safe R404A refrigerant. Access to and servicing of both ice-maker and bin is accomplished by removing the front panel. If desired, extra storage space may be specified in lieu of ice-maker. Air-cooled option is also available. CMP Nourishment/Medicine Centers have a paper towel and cup dispenser located beneath the top storage compartment. Self-Defrosting Freezer, approximately 1 cu. ft. (28 liters).